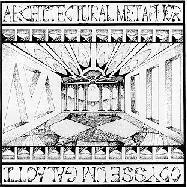 Architectural Metaphor is a Massachusetts based outfit that plays an often heavy, but always ethereal brand of spacerock with an emphasis on sound experimentation and exploration. The band consists of Paul Eggleston on keyboards and electronics, Deb Young on vocals and percussion, and Greg Kozlowski on guitars and effects. To date the band has released two CD's. 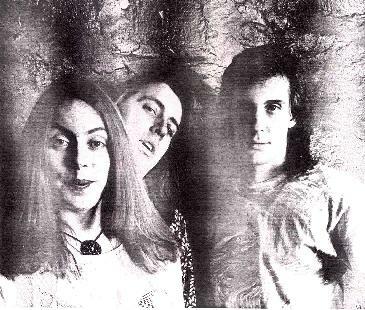 Much of 1994's "Odysseum Galacti" was recorded in 1988 by an earlier incarnation of the band, and last year's "Creature Of The Velvet Void" was the first full-blown work by the current lineup. 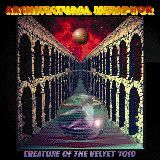 They have also contributed to such compilation CD's as the 1996 Cleopatra Records Space Box, and performed "Cirkus" on Cleopatra's Tribute To King Crimson. I caught up with the band by phone after a practice one evening in January and chatted with founding member Paul Eggleston. AI: What little I know about the band's history is that you started in 1984 and waffled between a five and six piece until whittling yourselves down to the current three piece lineup. PE: That's been the stable lineup since probably February '94. AI: How has the music developed over the years, and was the music featuring the earlier lineup on the first CD actually recorded in 1988? PE: Yes. The first six songs are from '88, and the last two are the first taste of the current lineup. I think that's a quartet on the first record. We were up to a sextet at some point. We were kind of a John Cage/Karlheinz Stockhausen version of Hawkwind. Very free music experimental, almost no songs at all. And there were certain song structures that kept coming back. And that is probably the main link to the past band that our songs we play today even though the songs come out different every time. And so they're just kind of architectural structures that we hang our little ideas on and sometimes they go places even we can't believe. AI: One of the differences I notice between the two CD's, and even starts to show on the two songs on the first including the current lineup, the earlier songs have a more improvising, sound exploration feel. And while Creature has all of the above, it seems to be more structured. More within a melodic song framework. Was this intentional or just the way things worked out with this lineup? PE: When Deb become less of a percussionist and more of a drummer we turned a little more into a rock 'n roll direction. And with a rock 'n roll direction the vocals come swirling in and its more of a powerful focused version of the chaos than we had before. AI: Had she sung earlier or was that something that developed in the past few years. PE: She did vocalizations on the first record. She was the space whispers on O.Galacti and the older material. But one day we had a song that had words and they keep cropping up now. AI: I think its worked out well. The vocals work really well with the music. PE: Its almost kind of an Amon Duul II'ish feel that we get with her singing. Sort of a harnessed, Teutonic, magical chaos. AI: And you plan to continue that? PE: Yeah. We're working on our third record right now and its more in the direction of the second album. AI: Is that going to be on Black Widow also? PE: We're not really sure right now. AI: Has being on Black Widow helped you in terms of distribution? PE: We're having some distribution problems right now in terms of getting it into this country. This is the first record they've ever had to promote as a full-scale U.S. project. They're much more of a European continental outfit so we're just learning together how to properly promote a U.S. band. AI: How did you hook up with them? PE: We got a lot of attention right away in Europe being sort of children of the Krautrock scene. We played music that was immediately recognizable on the continent in Northern Italy, Germany, and France as something that had never really gone away over there. That stuff always kind of stayed popular. So they distributed us on our first record and they liked it a lot. And then all of a sudden they decided to do a second record with us. AI: Any discussion or possibility of going over to Europe to play any shows? PE: We're talking about going over for the summer to do a tour of the festivals or perhaps a small tour of Italy. Spring we're working on a small U.S. tour with Melting Euphoria. AI: You've done a Hawkwind cover on each CD, a Velvet Underground cover, and you covered King Crimson's Cirkus on the Crimson tribute. I was going to ask you about your influences and what you like, and I'm even more curious now that you've thrown out names like Cage and Stockhausen. PE: (Laughs) Our influences were very strongly avant garde classical. Glass, Cage, Reich, Stockhausen. The tranciness of Reich and Glass we enjoyed and tried to mix in the chaos and randomness. The randomness of Cage and Stockhausen were very important to us right from the beginning and I think that its a strong trait that's carried through. But beyond that Hawkwind was one of the big influences on everybody. Greg's a major Pink Floyd head. And we all like Floyd. But as far as more esoteric things it was mostly German bands that really heavily influenced us. Guru Guru, Faust, Can, Tangerine Dream, Amon Duul II, Magma... even though not a lot of it shows up in our music it was very influential. AI: I'm a non-musician, but I'm fascinated with the creative process. Tell me a bit about how you put songs together. Obviously there's a lot of improv, but tell me about improv versus any elements of composition or structure. PE: For the most part I think this is an element where the original Architectural Metaphor songs came from. It's a little something that just comes out of the air during a practice and catches a groove and pieces start to form around it. And we go back, start with that riff, embellish it, and then eventually it turns into a song. AI: So you just roll the tapes and see what happens? PE: Yeah, the tapes rolling when we're rehearsing and jamming and fortunately for us these little beauties just appear out of the air. And then we can sort of pound them into shape in some kind of ironworks fashion and get them into a form that's recognizable as a song and pleases us and hopefully other people. But hopefully us first. AI: I think you've got a nice combination of tunes that just go out there and have a jamming feel, but also have that structured song feel to them as well. PE: Its a delicate balance to get. I really do think that we did capture that delicate balance. For me the perfect song has always been something that can take you on a journey. You feel like you've been on a ride. And when the song's over you just kind of look up and whoooosh.... "Wow, I was on a ride". AI: I hear space, psych, ambient, electronic, all kinds of things. PE: There's a whole lot of bands coming out of the Midwest that are in the Tortoise school of sort of post-punk trance Kraut. But none of those bands can really let it rip. They can sit there and do dronish Velvet Underground chordal drones that are very interesting and powerful, but to be able to capture that kind of power in a trance and then hit people in the face and rip the roof off the barn... now that to me has always been the ultimate band. AI: And that seems like a challenge too. I think you take a chance when you get on a droning sound and there's a risk for bands of not really taking it somewhere. PE: Well we do have the droning aspect, and then we have the electronic old-school Tangerine Dream side to us. And then the old-school rock 'n roll, Krautrock, Amon Duul II. AI: I'm looking at equipment lists on your two CD's. The equipment list on Creature for three people is like ten times the amount for four people on the first CD. Do you really incorporate all these things into the music? PE: (Laughs) Well that's one of the exciting things about coming to see us live. Greg has this museum's worth of vintage pedals and effects on stage. You go see a band and the average guitarist has three or four pedals in front of him. And Greg has this minefield of pedals arrayed in front of him, and I drag all these old-school and modern synthesizers on stage and I'm completely surrounded in this little fort of equipment. So I'll be on stage with anywhere from six to nine synthesizers, and Greg will have up to a dozen pedals on stage. AI: Speaking of live, I'd like to talk about your live situation a bit. I know you played the Strange Daze festival last year, Orion Studios, Cleveland, Chicago. Do you get to play out much? PE: What we're really looking toward now is an organized tour. Something like going out with Melting Euphoria and doing a 12-14 day tour. AI: Tell me about Strange Daze. Do you think it was really an "event" in terms of the American space rock scene? AI: And do you feel like it succeeded in that? PE: Yes, it really did. I hope that Strange Daze next year will triple the attendance. AI: What's your opinion of the space/psych scene in generally both globally and in the U.S.? PE: I think, as strange as it sounds, that the happening scene is in America right now. Bands like Porcupine Tree and Ozric Tentacles... Ozric Tentacles have lost one of their founding members and are slightly rudderless right now. Porcupine Tree play a kind of safe version of spacerock. And the real exciting and challenging bands are all in the U.S. right now. Strange Daze was a gathering of the tribes. The west coast, the east coast, and the center of the country all met and laid it down for people. And in terms of what's out there for other bands I think the U.S. is where spacerock has taken hold. PE: Very nice to chat with you.